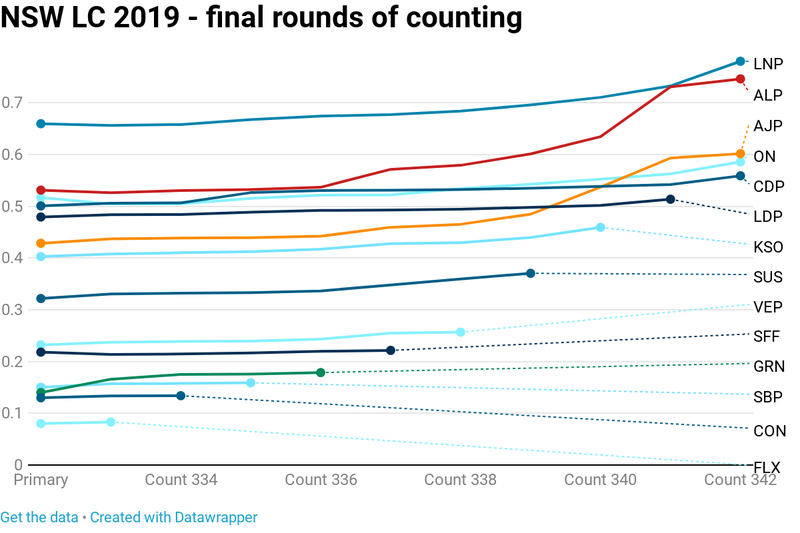 This chart shows the preference flows between the leading parties over the last 14 rounds of the count. The first data-point represents the primary vote for that group, subtracting any full quotas used to elect candidates earlier in the count. The chart then commences from the round after the exclusion of Socialist Alliance lead candidate Rachel Evans. You’ll notice that most parties have a slow increase in support, but in most cases parties maintain their order from the primary vote. Animal Justice and Labor both experience a big increase in the vote, which saw the AJP overtake three other parties, while Labor lifted their support to a much safer position. Labor gained 0.2 quotas worth of votes between their primary vote and the second-last round of counting. Animal Justice picked up 0.165 quotas over the same period. In comparison, neither One Nation, the CDP or the LDP picked up more than 0.05 quotas, while the Coalition picked up just over 0.07 quotas. Preferences were consistently higher when parties of the left were knocked out. About half of all votes flowed as preferences when the Greens and Socialist Alliance were eliminated, with Keep Sydney Open’s preferences flowing at 43%, Jeremy Buckingham at 39% and Sustainable Australia at 37%. In contrast, only 22% of Liberal Democrat preferences flowed to another candidate (admittedly this was at a later stage with less options), and only 23% of Shooters preferences stayed in the count. You could have predicted this trend from the how-to-vote cards, with most parties of the centre-left encouraging preferencing while those on the right did not help each other. Yet preference flows mostly did not follow how-to-votes. Twice as many Greens preferences flowed to Labor as they did to Animal Justice, who were given the ‘2’ on the Greens how-to-vote. Animal Justice received 11,385 preferences from Keep Sydney Open, compared to 19,462 votes for Labor. Considering that these smaller parties wouldn’t have handed out too many how-to-votes, it suggests that there is something beyond how-to-vote card decisions that is encouraging progressive voters to preference in a way which we don’t see amongst conservative voters. One other interesting statistic is the proportion of quota for the last candidate to be elected. This time it was 58.6% of a quota, for One Nation’s second candidate. After five elections using the modern optional preferential voting system, this is the second highest figure for this person. The Animal Justice Party’s Mark Pearson snuck in on only 46.6% of a quota in 2015, while the Shooters’ John Tingle was elected on 49.6% of a quota in 2003. The Nationals’ Sarah Mitchell won her seat with 56.3% of a quota in 2011, while the best result was in 2007, when Trevor Khan won off 60.9% of a quota. It would be encouraging if this number was to gradually increase, suggesting more votes would be playing a role in electing the final MLCs. Finally, here’s a table showing the proportions of quota each party held in the final rounds of the count. centre-left? greens, animal justice really? I guess one nation is centre-right then. Thanks Ben. I don’t think anybody has shown the eliminations and accumulations in graph form before. Very helpful. Very curious to see that the SSF voter’s preferences ended up exhausting. You would have thought there would have been a decent flow to the LDP. Seems like the party that benefited the most from the preferences (in terms of positioning) was the AJP who moved from 6th to 3rd, knocking off the LDP in the process. As you said, that congregation of the left-wing parties behind AJP proved to be the difference. Can one reasonably draw the inference that optional preferential voting hurt the right more than the left this election? Does party fragmentation and interparty hostility especially correlate with poor performance with OPV, and does CPV reduce its damage elsewhere? Or am I drawing exactly the wrong conclusion?